Blues guitarist Duke Robillard has earned his share of W.C. Handy/Blues Music Awards yet he doesn’t seem to receive the respect due his status as not only one of the most innovative artists in the genre, but also one of blues music’s greatest traditionalists. These two things aren’t as mutually exclusive as they may seem – Robillard’s creativity as an instrumentalist has influenced a generation of blues guitarists, his immense legacy built not only on his tenure with seminal modern era blues bands Roomful of Blues and the Fabulous Thunderbirds, but also for his lengthy and exhaustively prolific career as a solo artist. With dozens of albums released under his own name, Robillard has also recorded and toured with folks like Bob Dylan, Tom Waits, Pinetop Perkins, and Robert Gordon, among many others. As a producer, Robillard has produced albums by such diverse talents as R&B great Jimmy Witherspoon, Chicago harp wizard Billy Boy Arnold, Kansas City piano giant Jay McShann, and legendary jazz guitarist Herb Ellis. Robillard’s role as a traditionalist extends beyond his work in the studio with legendary figures into his own recordings, where he regularly revisits and often re-interprets blues and jazz songs from the 1920s, ‘30s, and ‘40s, exposing this influential material to a new generation of fans. 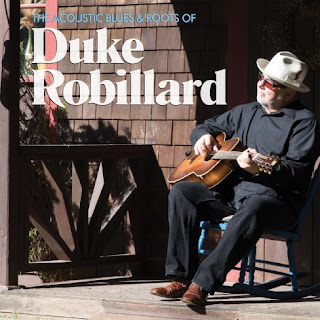 On September 25th, 2015 Stony Plain Records will release the guitarist’s The Acoustic Blues & Roots of Duke Robillard, the follow-up to his acclaimed 2013 album Independently Blue. Featuring Robillard’s underrated vocals and performances on multiple stringed instruments, the guitarist has dipped into his Rolodex to enlist the help of several talented friends to appear on the album, including singers Maria Muldaur and Sunny Crownover, harmonica player Jerry Portnoy, the late pianist Jay McShann, and some other well-known names in the blues world like sax player Doug James and drummer Mark Teizeira, among other folks. With The Acoustic Blues & Roots of Duke Robillard, the guitarist reaches into the great American songbook to dig up songs by blues legends like Big Bill Broonzy, W.C. Handy, Sleepy John Estes, and Robert Lockwood as well as country tunes by Hank Williams and Jimmie Rodgers which are interpreted by Robillard in his own indomitable style. The album was recorded primarily at Robillard’s own Mood Room studio with additional work done at Lakewest Recording, and some live recordings captured at Blackstone River Theater in Cumberland, Rhode Island. You can bet that if it has Duke Robillard’s name on it, The Acoustic Blues & Roots of Duke Robillard is going to be great, and if all you know of the blues and American music comes from the legion of Stevie Ray Vaughan clones weighing down bar stools across the land, you owe it to yourself to open your ears and expand your mind with The Acoustic Blues & Roots of Duke Robillard!